Pull up this stylish stool for a bit of beauty in the boudoir. 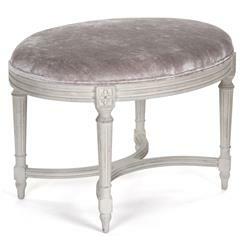 Opulently upholstered in silver-grey velvet with shades of lavender, the cushion makes a comfortable seat at a vanity or a luxurious ottoman. The birch frame is delicately detailed with floral accents, completing the romantic feel of the piece.